“The Beith Birch initiates the first lunation. At this time of year, as we prepare for winter and seek deep transformation, we honour the crone aspect of the Goddess. Although crones are harbingers of death, they are also responsible for birth and new life. They are our midwives. After a period of emptying and releasing old patterns, acknowledging disappointments and regrets and embracing our achievements, we listen carefully to the quiet voice within and set our intentions for the year to come. In this way, we plant the seeds of future possibilities and establish the foundation for the year ahead, which heralds in what we call the dark half of the year, when the new gestates in the dark. Birch will also help in the peaceful resolution of conflict. She provides a higher perspective and spiritual understanding. She will return you to a state of innocence and non-judgment. 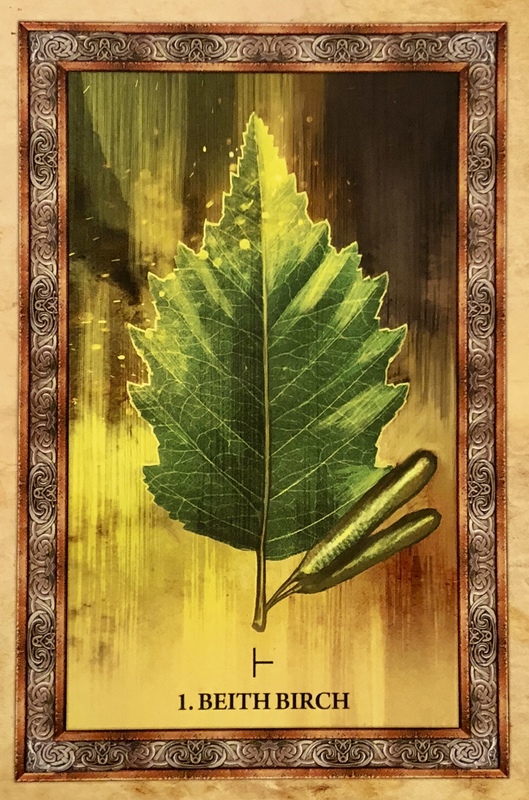 The ogham for this tree is Beith and the letter B.
Beith Birch In A Reading: “When you draw the Birch card, you can expect new beginnings. However, in order to move ahead, you may have to tie up loose ends and let go of what is no longer needed. Therefore, Beith Birch also stands for cleansing and purification. Old patterns are released, and you can shed unhelpful influences, now, just like this tree sheds its bark. This is a time for forgiveness of yourself and others. There is the promise of new starts, renewal, and new life. This is the time to set new intentions, now that you have let go of last year’s energies. Sit quietly so that you can listen deeply. From your heart, begin to formulate new plans and intentions. This is the time to decide what seeds you will plant and cultivate for the year ahead. Birch also offers healing, peace, and resolution in times of conflict. Her branches are pliant and supple. Take a Birch leaf or twig with you – or imagine her in your mind’s eye – when you must resolve a conflict. She brings in the power of peaceful reconciliation. As Challenger: “Perhaps you are reluctant to let go of that which is keeping you from moving forward – afraid to release old patterns and unhelpful influences. You may not be ready to forgive or to deal with conflicts. Perhaps you are hanging onto the old, and it is not serving you. Think about where you are not allowing your life to flow naturally. What are you holding on to so tightly that nothing can change? You are encouraged to let go so that you can move forward. Set you house in order. This is probably not the best moment to begin something new, as you have work to do to prepare first. When your thoughts and feelings are aligned with your highest good, then you will be able to clear the way and begin. Message: “I am the beautiful Birch tree. I wear bright gold and red leaves in the autumn. My branches grow down long and slender; my many heart shaped leaves dance and whisper in the wind. Close your eyes and listen to the sounds of my leaves rustling in the autumn winds. Listen to my encouraging messages. See how I love to grow tall and straight? Look up and see the sky. Look all the way to the tip of my highest branches. Look to the light, and as you do so, allow yourself to lighten up. Imagine you are the eagle landing on my highest branch. Seek a higher perspective. You can see the whole picture – the exact opposite of not seeing the forest for the trees! What do you notice? Every single thought we have is tainted by some sort of belief system we have adopted around it, particularly thoughts about ourselves, our value and our capabilities. We see things through a lens particular to us; our experiences, our hurts, our victories and our failures. We take our lives and we live it according to the thoughts, beliefs, feelings, habits and patterns that we are used to. That feel comfortable to us. Maybe they are inherited culturally. Maybe we get them from society. From family. A teacher, a relative, a caregiver, a neighbour. Role models, rock stars, celebrities; people we look up to. Every single person we have interactions with leaves an imprint. It could be just a trace, or it could be something much larger that we hold on to, carry with us for the long term. But how can we create something brand new if we can only perceive what is possible through our narrow lens? What if we were to take a really good long look at the lens itself and see if we have perhaps outgrown it? What if we realized we were looking through someone else’s lens this whole time? What if we didn’t even need a lens? Then what would be possible? There are new beginnings coming, that is no surprise. The new year is within reach. A brand new year to play with, to create with, to dream into being. But how will you create it? What will hold you back from creating something more amazing than you have ever created before? What could you release so that you could do things in a completely new way? Take some time to think outside the box. Dream a whole lot bigger than you usually do. Refuse to look through that old lens.